Crisis and disaster management requires the sharing of complex information among numerous entities and individuals. Traditional knowledge management techniques are being used in government agencies responsible for disaster management, but many new technologies and practices, particularly the Internet and Web 2.0, are creating opportunities for individuals, responders, and trainers to share what they know and to acquire needed information, and prepare for the next crisis. However, the use of networked technologies, like the Internet, is still in its infancy, and the use of them diffuse, with very little cohesion among researchers and practitioners in disaster management. 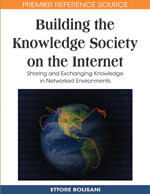 We argue that although the Internet is already in extensive use in disaster management, knowledge management will only be effected if top-down and bottoms-up approaches to information gathering, organization, and dissemination are implemented. The aim of this chapter is to provide an introduction to some of the many technologies, practices, and open problems for knowledge sharing in disaster situations, outline some persistent challenges, and suggest venues for exploration and practice.